FIRST CYGNETS for the BLACKFOOT SWAN PROGRAM arrive in year of Montana’s Epic Floods! When it rains it pours and this year’s weather has certainly proved that in Montana, where flood levels have reached epic proportion. 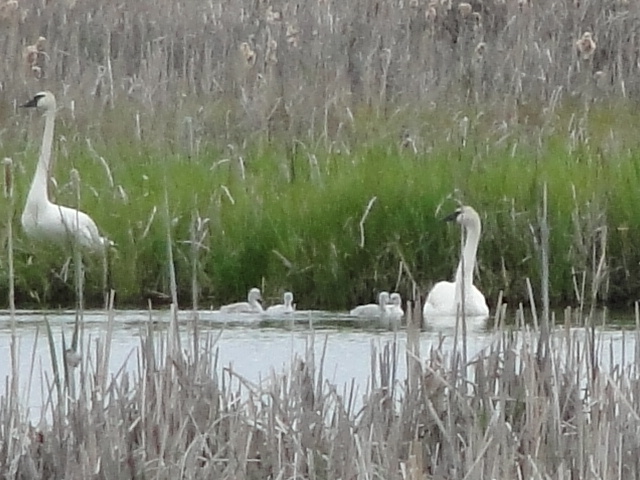 What’s amazing is that Trumpeter Swans could sit on a nest for 33 days of rain and cold weather and produce young. Not only did one pen (female) do that this spring, we confirmed a second clutch hatched on the first day of Summer. Thanks to the many supporters of the Blackfoot Swan Program, we have turned the clock back in time to the good old days. Trumpeter Swans are once again scattered across the Blackfoot Valley and for the first time in over a 100 years, are producing cygnets (young) in this amazing valley. Over the last week we have added 7 white downy puff balls to our landscape. The first nest located north of Helmville hatched out late last week adding 4 beautiful cygnets (attached photo) to the valley. On the first day of summer, three cygnets came off a nest northwest of Ovando while we were lucky enough to be on a hillside watching them. To see a little white head pop out of the pen’s wing while still on the nest is a once in a life time experience. While we still have a ways to go to get to 7 nesting pairs, we certainly turned the corner in a big way in 2011. We could not have gotten to this point without the support of the many amazing people, conservation groups and agencies participating in the Blackfoot Swan Program. From the landowners who own and manage the wetlands in the Blackfoot Valley, to the many folks who have financially supported the program, to all the bird releasers, students, teachers and bird lovers who have reported over 800 observations over the years, and to the all swan helpers that have logged hundreds of miles going to Canada to Jackson Wyoming and up the Blackfoot, we couldn’t have done it without each and everyone of you. So thanks to all of you from the Swans of the BlackfootValley. Come join TTSS at the 22nd Annual Conference this year in Montana and learn more about this and other exciting restoration effort and TTSS’s other programs. October 11-14, 2011. You are currently browsing the Trumpeter Swan Society Blog blog archives for June, 2011.